Erected by Jane McKenzie in loving memory of her mother. Ann craig died 28th July 1907 aged 106. Granddaughter Jane Sinclair died at Pernambuco Brazil SA 3rd February 1905 aged 25. Daughter Margaret Taylor died 24th June 1914 aged 78. 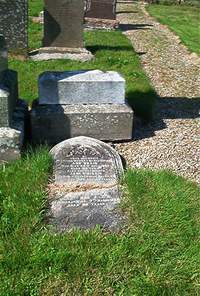 Daughter Jane MacKenzie died at Wick 7th March 1938 aged 96.